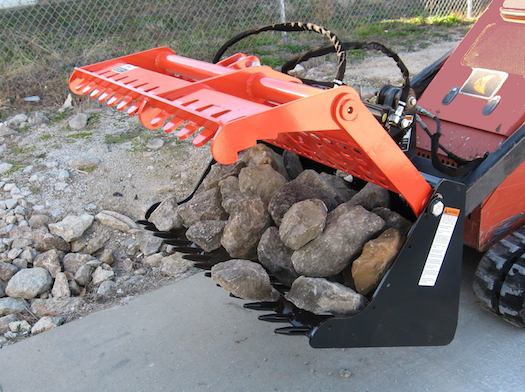 Worksaver, Inc. introduces the new 42” SARG™ (Sweep Action Rock Grapple) for mini skid steers/compact tool carriers for handling rocks, brush, logs, stumps, debris, scraps and more. The patent pending design allows operators to sort large or small rocks and debris with just one tool. The front grapples operate in a sweeping action to pull rocks or debris into the bucket for easy site clean-up. The grapple design then retains the rocks or debris while the operator rocks the attachment to sift out the dirt. Lower tines are made from 1” solid round and are spaced 3” apart. An optional bolt-in 10-gauge solid bottom is available for those jobs requiring all the material be retained in the bucket.